According to Square Enix, the upcoming game Dragon Quest Heroes will be available October 13th for North America and October 16th for Europe. In this installment to the Dragon Quest franchise, players break away from the RPG-style gameplay and challenge hordes of enemies and ginormous monsters in a hack-and-slash fashion. If you enjoy collecting goodies from big titles, there’s also a collector’s edition that’s been revealed. 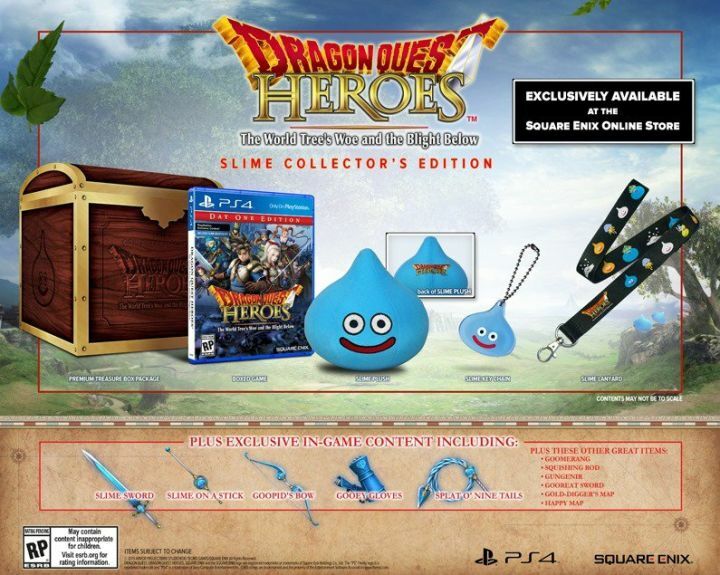 It’s exclusive to Square Enix’s website and it comes with an adorable slime plushie, slime keychain, and slime lanyard. The collector’s edition also comes with a treasure chest, bonus quest items, and additional weapons for your hero! What are your thoughts on the new Dragon Quest game? Let me know what you think in the comments below!